The Zoom for Outlook add-in is designed to manage scheduling within the Outlook web and desktop apps. The add-in allows you to easily add a Zoom meeting to any new or existing calendar event. Note: To install Zoom for Outlook on the Outlook desktop app, you must have a Microsoft Exchange account added to Outlook. If you only have an IMAP account, use Zoom for Outlook on the Outlook web app. Log in to the Office 365 Admin Portal. Navigate to Settings (gear icon) > Services & add-ins. Review the information on Centralized Deployment and click Next. Select I want to add an Add-In from the Office Store. Search for Zoom for Outlook and click Get it now. Review the add-in details and click Next. Select how you want the add-in deployed at your organization. Optional, enabled: The Zoom for Outlook add-in will be added for all of your users, but they can remove it. 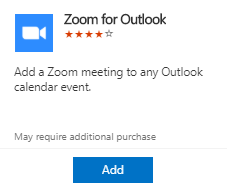 Optional, disabled: All users will have the option to add Zoom for Outlook, but it will not be added to their Outlook by default. Mandatory, always enabled: The Zoom for Outlook add-in will be added for all of your users and they will not be able to disable it. Select who has access to this add-in. You can search for groups to add them. Click Save. The manifest file will process. Note: Users may need to restart their apps to see the new add-in. Depending on the number of users in your account, changes may also take a few minutes to propagate to all users. You can install the Zoom for Outlook add-in for your own use if installing add-ins is permitted by your Office 365 admin. Log in to the Outlook web app (OWA). Click the Settings gear in the top-right corner > Manage Add-ins. 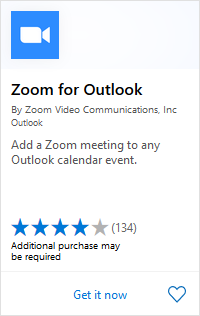 Search for Zoom for Outlook and click Add. The Zoom for Outlook add-in will now be available in Outlook. Open your Outlook web calendar and click New to create a new calendar event. Enter meeting details like the title, location, and guest list. Click the Zoom icon in the top toolbar. You will see the Zoom sidebar open, prompting for your Zoom credentials. Sign in to your Zoom account. If you are already signed in to the Zoom web portal, it will log you in automatically. Select your desired video, audio and meeting settings. Click Add Zoom Meeting to add Zoom join details to the meeting. Note: The meeting settings will automatically populate with your default settings found in your Zoom web portal in My Meeting Settings. Open your Outlook Web Calendar. Click on a Zoom meeting, and click Edit. Click the Zoom icon in the top toolbar. Sign in to your Zoom account if prompted. Tip: Click Load default settings to load your default settings found in your Zoom web portal in My Meeting Settings. If you only have an IMAP account, use Zoom for Outlook on the Outlook web app. Open Outlook and click File > Manage Add-ins. Outlook will open a browser and open your Manage-ins page. Click the plus icon > Add from the Office Store. 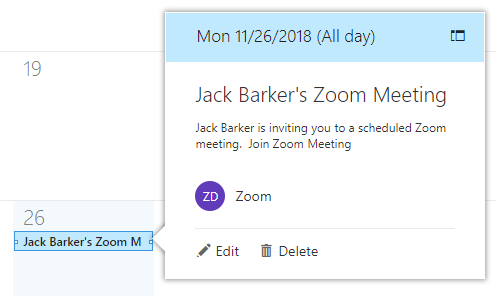 In the Meeting tab, click Add a Zoom Meeting. Click Add a Zoom Meeting to display the Zoom meeting options. Tip: Click Load default settings to load your default settings found in your Zoom web portal under My Meeting Settings.